Look! Linden is taller than the Q1 building! I seem to have a talent for finding really hot houses to live in. Our last one was dreadful, even once the insulation was put in. This one we are in now is a steamer inside, despite being located in amongst rainforest trees. Finally summer has turned the heat up and here we are in this sweatbox with six grumpy kids (we share with another family) – and actually it is much more pleasant to be outside, except we can’t be out for long because of the darn sun, those crazy UV rays, and our fair skin. So we hang out on the verandah or in our rooms with the fans on and think of places to go for a swim. 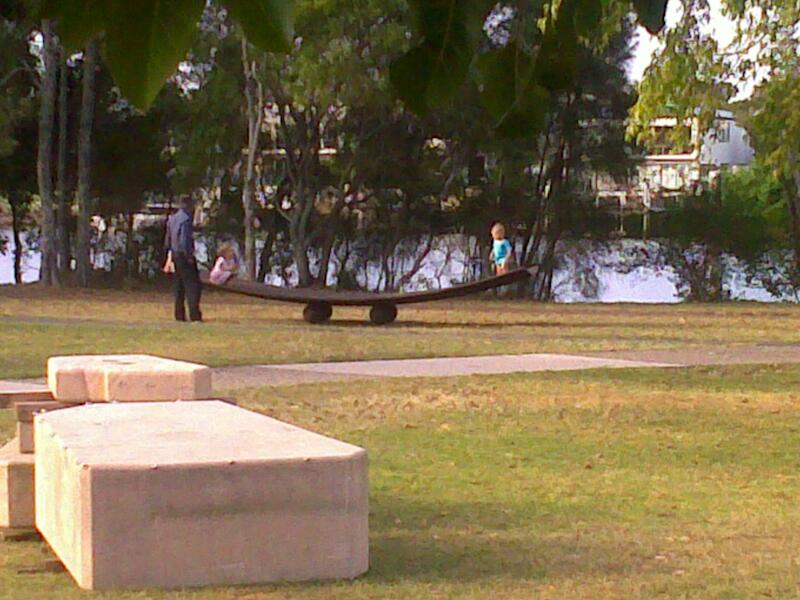 Yesterday it was Evandale Lake at Bundall, just behind the Gold Coast Arts Centre. We had so much fun we went back this afternoon. Honestly, this place has everything going for it: parking (but don’t park in the staff car park or you might get a ticket! ), a fenced play park, toilets with showers, picnic shelters, bbqs, shady trees, a still and clean salt water lake (with fish! ), a clean beach, a bike track, an outdoor exercise circuit, public outdoor art (including one by our own Antone Bruinsma that I always stop to think about), and of course there is the art gallery right there too. In the afternoon the lake has warmed up and it is like swimming in a gigantic bath. The kids like the shallowness of the water by the shore, and the dip to the deep water is so gradual that they have got plenty of room to swim and play confidently in water level of water they feel comfortable in. Even my 18 month old is happy to go walking in up to her chin because she knows she can just turn around and walk back out again. It has been a wonderful place for cautious swimmers to begin feeling confident in the water. 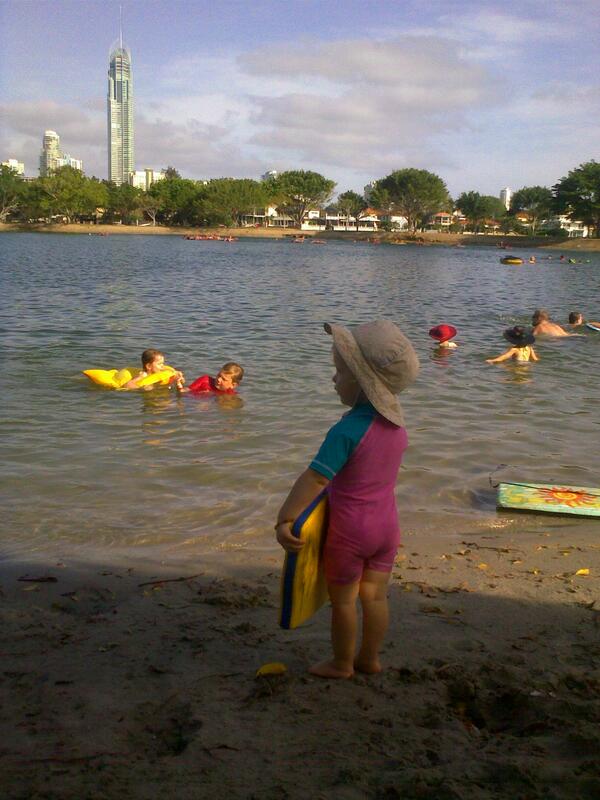 Yesterday we swam on our boogie boards right across the lake. It was a long way and our legs got tired from all that kicking! My son zoomed ahead like a speed boat and waited, looking very cool, for us to slowly kick our way over to him before he powered back to the other side. The trip back was easy for my four-year old, and her six-year-old cousin …. they hung on while I pulled them. Outdoor art the kids can play on. This one is irresistible for running on! 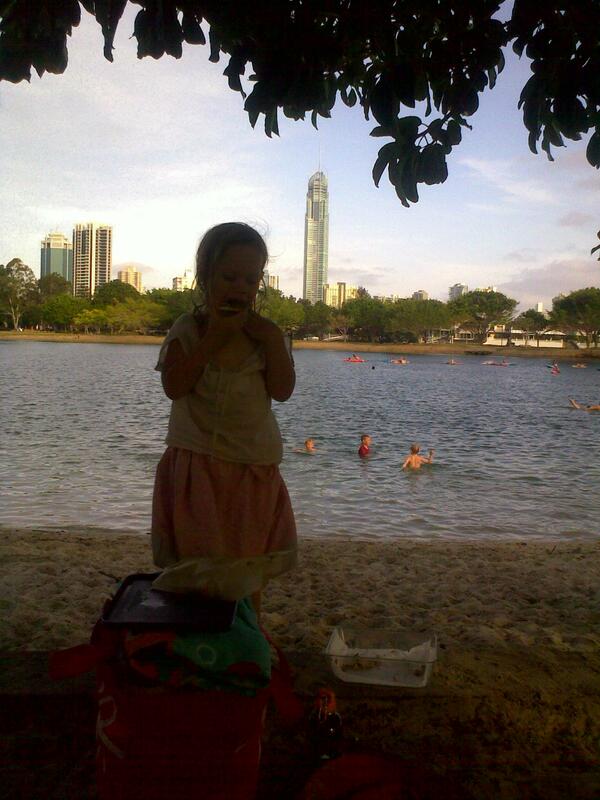 Our standard method of enjoying this park is to go in the afternoon and bring dinner. The kids play until they get hungry, then we dry off, get changed and eat, then play in the park until they looked pooped enough to go home. There are bbqs, but early evening hunger can’t wait for anything, so we find it best to bring dinner pre-cooked. Usually it is sausages and salad. Tonight it was pizza. On that note I have always considered pizza the challenge I need to overcome in cooking because just about EVERY part of it includes ingredients my tummy doesn’t like: nightshades, grains, yeast, sugar, cheese. I’ve made great gluten-free, nightshade-free, dairy-free pizzas before but today I’ve made a great grain-free pizza base. In fact I think it was MUCH tastier than the gluten-free base I made for everyone else. And easier to make. Essentially it is the same as the cracker recipe I like to make, except I used almonds instead of pepitas this time. No photo, sorry … we ate it. Here is a photo of Rosella eating the last of it though – but pizza is generally very pizza-looking. No surprises there. Whizz up the almonds and sunflower seeds into a meal in your food processor. (thermomix speed 9, about 15 seconds) Add the rest of your ingredients and whizz again to form a dough. With damp fingers, spread the dough evenly over a baking sheet on a tray and pre-cook at 180C until it looks firm and is just starting to go brown (but don’t actually let it go brown!). Spread your toppings on and put the tray back into the oven until pizza smells fantastic or until you think it is done. I was avoiding nightshades for a long time, so I do like to use homemade pesto as a base instead of tomato paste, however tonight’s toppings were a tomato base (with garlic and fresh basil added), olives, pineapple pieces, capsicum, sun-dried tomatoes, grated zucchini and goats fetta sprinkled on top. Do you know what else is nice on top of pizzas instead of copious amounts of mozzarella or cheddar (bleh!)? Labne. This is a cream cheese made by hanging up yogurt in a cheesecloth or loose-weave tea towel and letting the whey drip out over night. In the morning you have a bowl or very useful whey (don’t throw this out!) and lovely tangy cream cheese spread. So yummy, labne is great on its own instead of butter, or for adding to dips, spreading on toast or crackers with toppings – and dolloped on pizzas! Whats more it is a living food (particularly if your yogurt is made from raw milk) full of great probiotic goodness. Hi there, can you explain what “activated” means in regards to your 2 ingredients listed for the pizza please. Many thanks and have a great day.